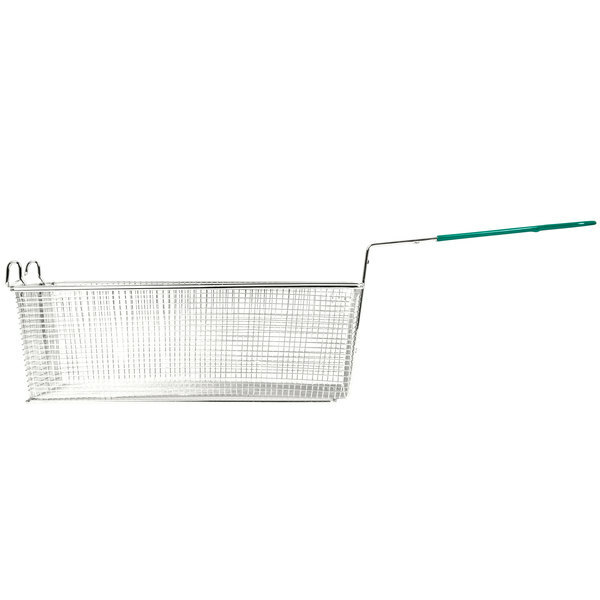 This rectangular, wire fryer basket has a nickel-plated finish with a reinforced base. This frying basket can handle the most rigorous of conditions. It is made of 8 mm, medium-wire mesh and has a sturdy, plastic, coated, welded handle. It is suitable for large fryers, and measures 17"L x 8"W x 6"H (excluding handle). Large fryer basket for holding fry foods to drain oil off of or cooking in the fry oil. The front hook is a great addition to clip to the fryer for draining excess oil. 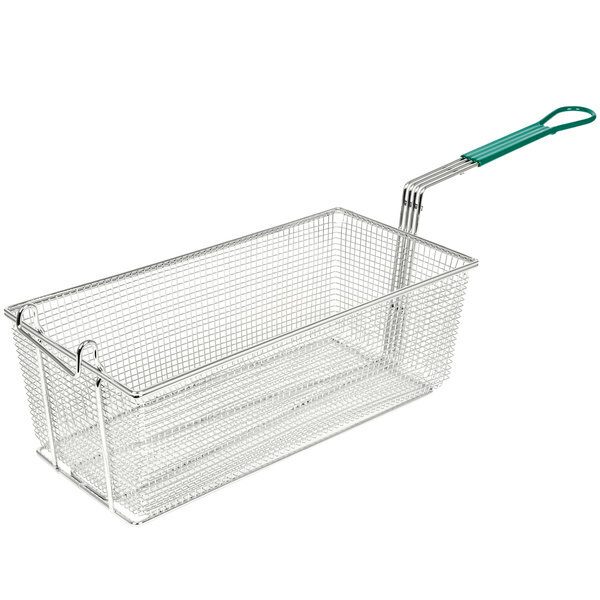 These fryer baskets fit our large “70 pounder” deep fat fryers. They get a ton of use, hold up well, and are easy to clean. For the price, you cant beat it, but only expect to get 1 to 3 months of use out of it before the wire welds start breaking. 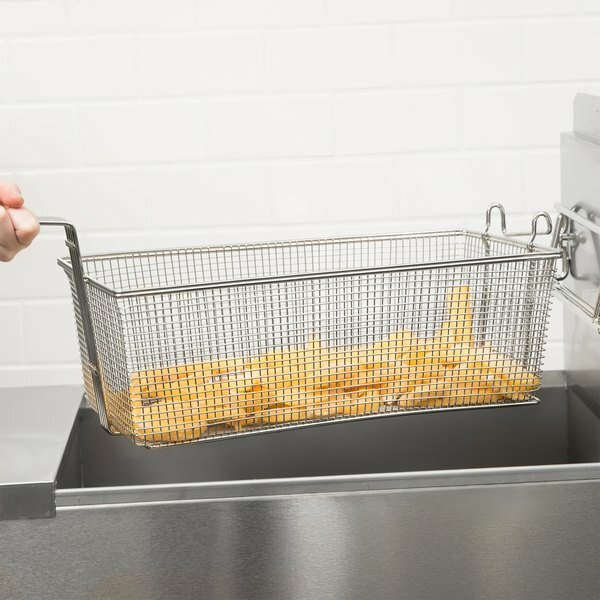 These fryer baskets with front hooks are very sturdy and light weight which makes for easy lifting especially when full. They fit great in both my 65-75 lb fryer and 80-90 lb fryer. Great buy for the price!!! Fits beautifully on my larger fryer. More lightweight than others I have purchased but with better durability. The weight makes it much easier to handle. These baskets are decent. Not top of the line, but for the price they do just fine. We fry quite a bit of heavy wings and they have held up well. We are so happy with these baskets. They are durable and hold up for a very long time. We use our fryer quite a bit and very happy with this product. This fryer basket is a great way for our cooks to complete their orders at a quicker pace. The size fits perfectly in our kitchen and is easy to clean. These baskets are the best priced I could find anywhere and the quality is as good as all the others.I would recomend there as a good replacement basket. Thank you for your review, Mary! We are sorry this basket broke on you, a Customer Solutions Representative will contact you shortly! Great product for the price your paying. The item were as described. Been using them since they arrived, so far they are holding up. Fast shipping. Thank you. Its a fry basket........ It does the job, don't think this is the last one you will ever have to buy but for the money its solid. Hello, Comparing to the price the product is good. the quality is not too good and the same time not too bad. overall, i recommended to others. Decent basket, great price. I run four 80-100 lb fryers in a kitchen that is operating 19 hours a day. These baskets are a great meeting of quality and price.